Upscale dining is not something that most college students get to experience while on a tight budget. So that’s where a May Term class comes in! Bev’s on the River was the first for our more expensive lunches. 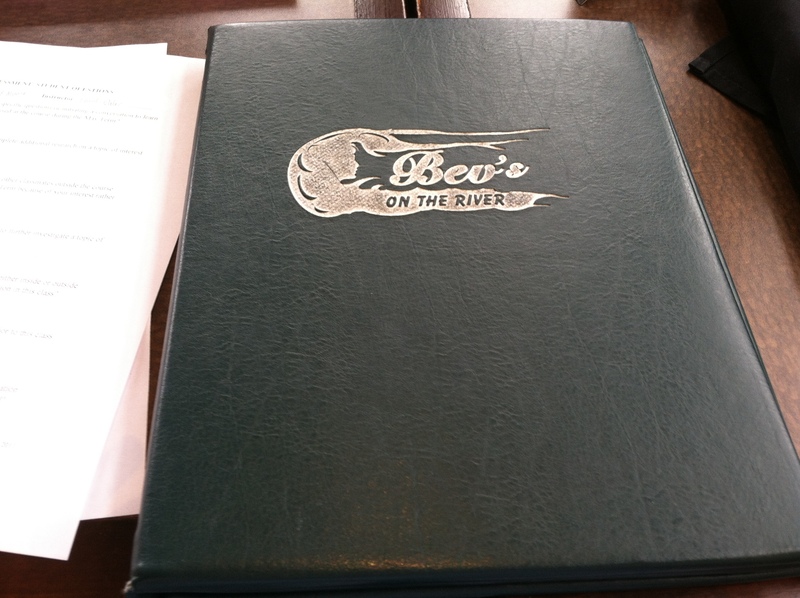 Anyone who’s lived in Sioux City in the past few years has heard of Bev’s, if not for the restaurant itself, then for the 2011 Missouri River flood in which Bev’s was forced to shut down temporarily. I guess that was the price to pay for their great location on the river. Today, though, Bev’s is back and thriving. I was excited to go try it out for myself and see if the price was really worth it. Obviously, Bev’s is right next to the Missouri River, giving it an excellent background for fine dining. Arriving at the restaurant, which is right next to the Hilton Garden Inn, you’re welcomed by a great outdoor appearance. 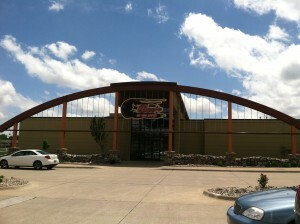 The structure of the building with it’s large sign and the river as a backdrop is a unique look for this restaurant. The logo for the restaurant is really interesting, too. It took me a minute to see the combination of a woman’s face inside a shrimp, but in the end, I do like it. It’s a unique take on a logo. I would, though, like to see it in a different color scheme, though. The black and red doesn’t sit right with the rest of the color scheme, particularly inside the restaurant. I actually like it much better on the cover of the menu. I’ve also seen the logo with a red glow around the edges used and I hope they retire that version. Readability becomes an issue with the red glow, and it just doesn’t look like something that belongs to a fancier restaurant. The interior of the restaurant uses a lot of stone and woodwork. They use a lot of natural colors, greens, browns, etc. which is something they might consider for their logo. The interior goes well with the scenery outside their large windows overlooking the river. The restaurant is very large, with the ability to accommodate a large number of costumers. Their menus were very nice. 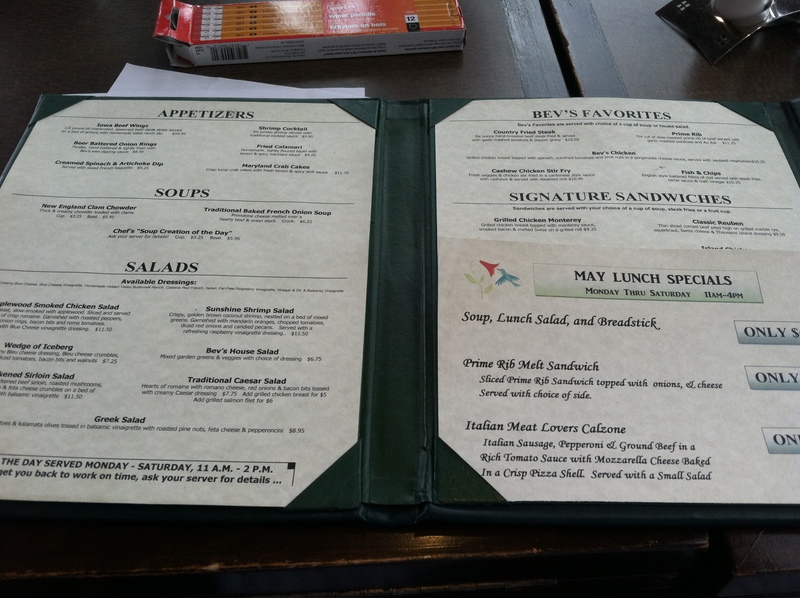 The thick covers and nicely printed materials added to the classier feel of the restaurant. They were easy to read and navigate. The colors (green cover and tan paper) went nicely with the rest of the restaurants interior as well. Because we were there at lunch, they gave us the lunch menu, so they featured mostly sandwiches and left most of their really expensive seafood items off for the dinner menu. As a group, we ordered a few different appetizers to try. The one that I really enjoyed the most was the spinach and artichoke dip. It was very good and we quickly ran out of the French bread and dip. 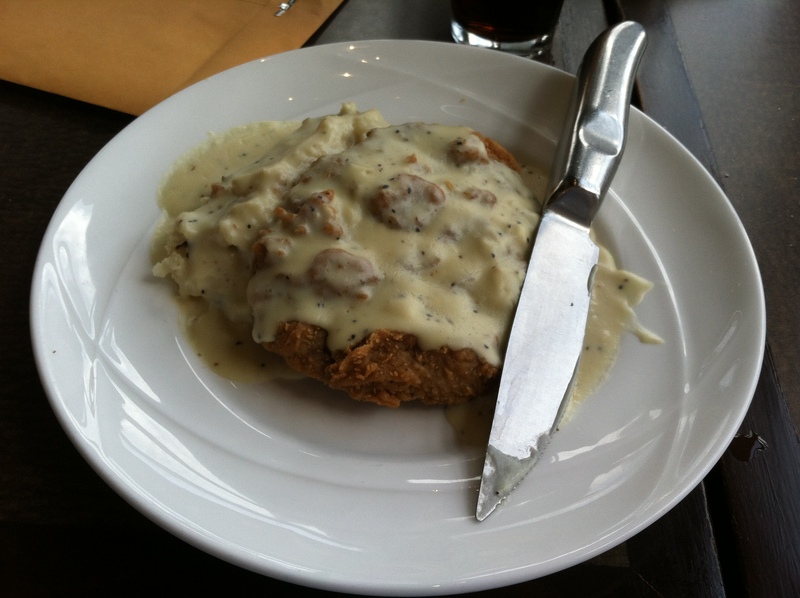 For my main meal, I ordered country-fried steak with garlic mashed potatoes. I also got a side of asparagus because my family has an asparagus patch and I was curious to see how they made it compared to how we typically have it. The country-fried steak was excellent, with the breading not to thick. The gravy was also very good, and went well with the garlic mashed potatoes as well as the steak. 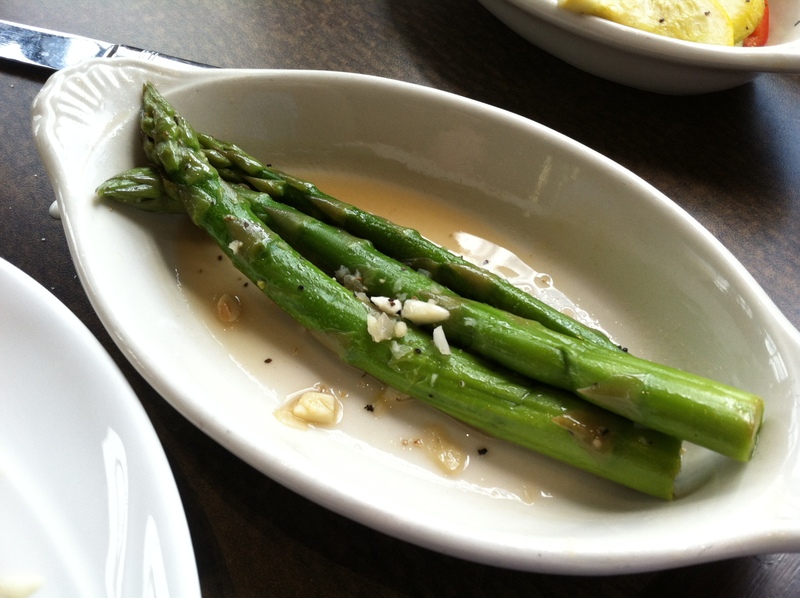 The asparagus was tasty as well, though I prefer my asparagus cooked a little longer so it’s less crispy, but it wasn’t bad at all. 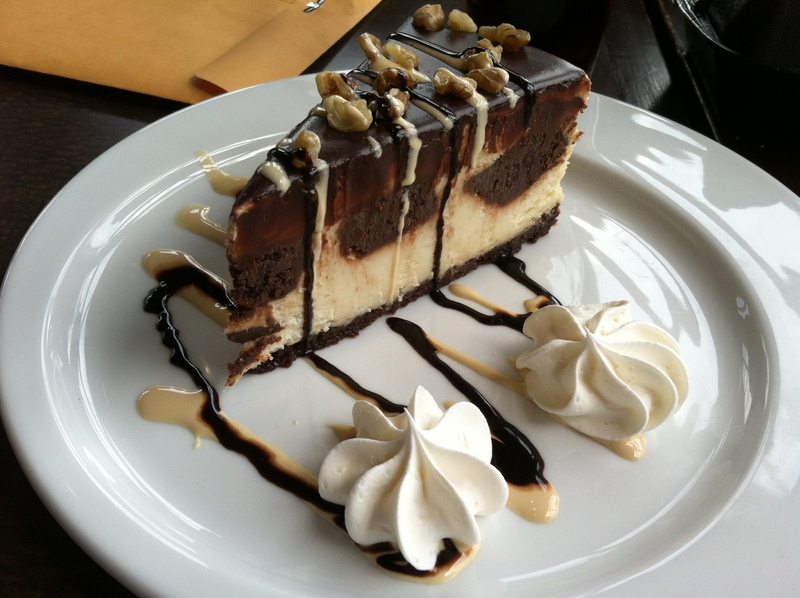 For dessert, I ordered the Chocolate Brownie Cheesecake. It was tasty as well, though I wouldn’t say it was the greatest chocolate cheesecake I’ve ever had. Bev’s on the River is a place that gains a lot from it’s excellent location. They can back up their more expensive prices with their location, excellent service, and tasty food. I hope to return to Bev’s one day, though that will have to wait until I’m out of college and in the real world so I can afford it!